Volume 40 / Issue 4 / 2018 newsletter from the MUSEUM OF PRINTING in Haverhill, Massachusetts, included LEAD GRAFFITI in an article entitled On the Road With The Museum of Printing. 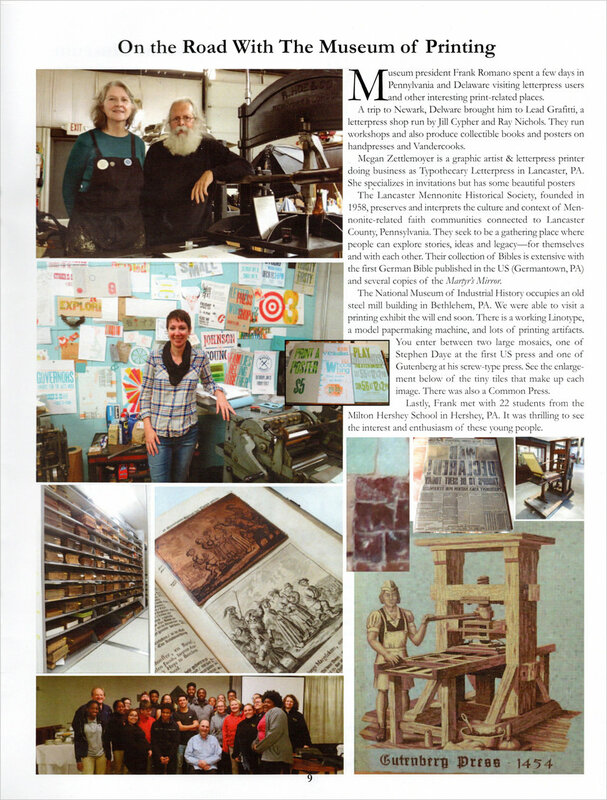 The article also included other area friends including, MEGAN ZETTLEMOYER of Typothecary Letterpress in Lancaster, PA; The Lancaster Mennonite Historical Society, The National Museum of Industrial History in Bethlehem, PA.
⬆ FRANK ROMANO, President of the Museum of Printing, recently spent the afternoon on October 16, 2018 in Lead Graffiti, talking about our studio and our creative work. He produced a video / interview for WhatTheyThink?, a website highlighting printing industry news, commentary & analysis, research and consulting.